What are sketchnotes and why are they growing in popularity? Sketchnotes are graphic recordings on a more personal level for the note taker. One key reason for their popularity is that anyone can do them. “It’s not about the art” as Mike Rohde would share with you, author of “The Sketchnote Handbook”, it’s about capturing conversations in brevity. There is no drawing skill level required or a particular style needed, just the use of intentional listening and filtering out the superfluous content and focusing on the key information to increase retention of information by combining text and graphics. 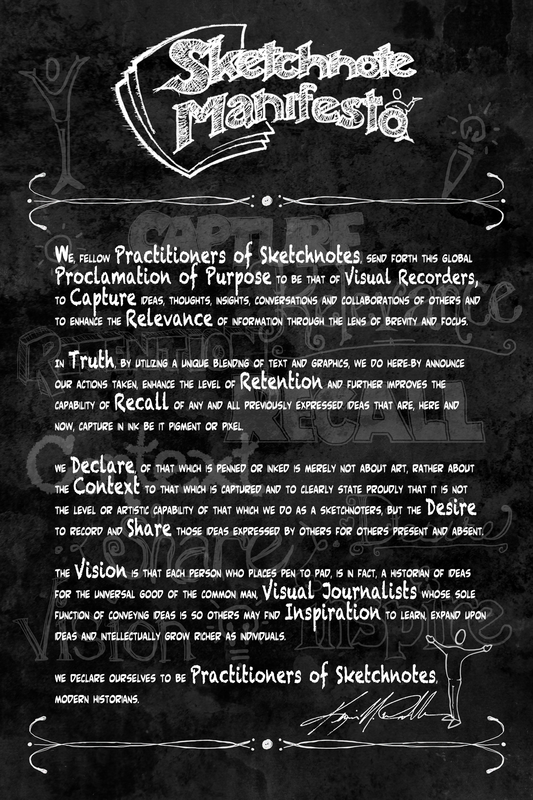 To express the impact that sketchnotes are creating, below is the Sketchnote Manifesto created as a precursor to an upcoming project. Enjoy and become part of a growing movement. Available soon, custom personable pledge manifesto.